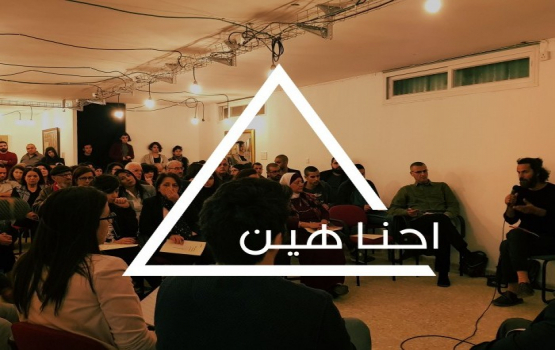 Tishreen aspires to shape a Palestinian society in the Triangle characterized by social solidarity and unity which is sensitive to and concerned with social issues affecting it. We believe in the values of democracy and equality and strive to achieve a well-developed communal, national and Palestinian identity. We seek the full realization of our rights and the attainment of a social and cultural infrastructure which addresses our cultural, economic, political and social needs. Tishreen seeks to empower and promote a society which is socially concerned and involved, which is invested in the greater needs of the community and which are full partners in forming/creation a better future for the next generation. Tishreen is a non-profit and non-partisan civic organization founded in the city Taybeh by a group of activists in 2008. Our board of directors, equally divided between women and men, is united by our shared concern for the social, political economic and cultural situation for our community of Palestinians in the Triangle. Despite our small size, we have developed a strong reputation for professionalism. Our activities primarily target women, youth, young adults and artists with the aim of promoting civic pride and public service and stimulating public dialogue in order to identify solutions to issues of common concern. Tishreen’s successes have inspired others locally and in the region to become change agents. Tishreen is one of the only functioning civil society organizations in the region. What makes Tishreen Association innovative? Tishreen sees itself as integrally connected to the local community and its members are active agents of social change, equality, and political and environmental justice. Our projects and activities of activism and social empowerment are formulated to address three major causes; Free and autonomous cultural expression for a rich and developed community, strengthening civil society through the promotion and formation of coalitions and cooperative relations among and between activists, youth groups and other existing organizations in the Triangle, and lastly, a multi-faceted approach to promoting civil dialogue and diversity to limit violent social behavior. We do all this with no funding from governmental agencies. How does Tishreen Association measure impact? Community outreach growth. Human capacity sustainability. A growing number of volunteers New and growing partnerships. Media attention. Numbers of activists trained and mentored who later found high ranking positions. Follow our work virtually. Share our work virtually. Send donations. Come, volunteer. Help us connect with other organizations globally.